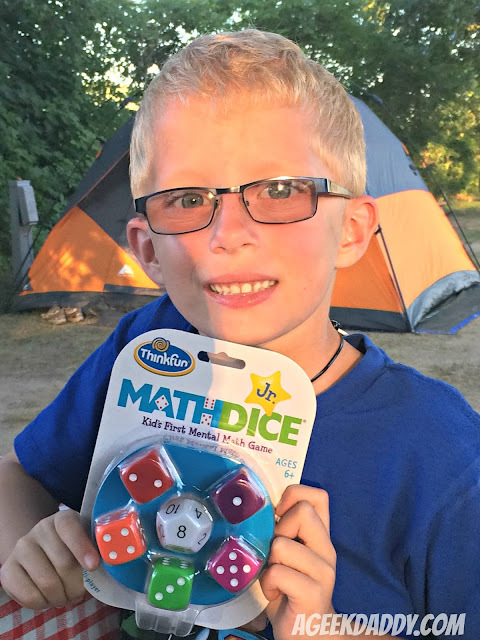 A GEEK DADDY: Math Dice Jr.
Our family had some fun during our recent camping trip playing a game called Math Dice Jr. from Thinkfun that I really like as a parent for my kids because it is both entertaining and educational. 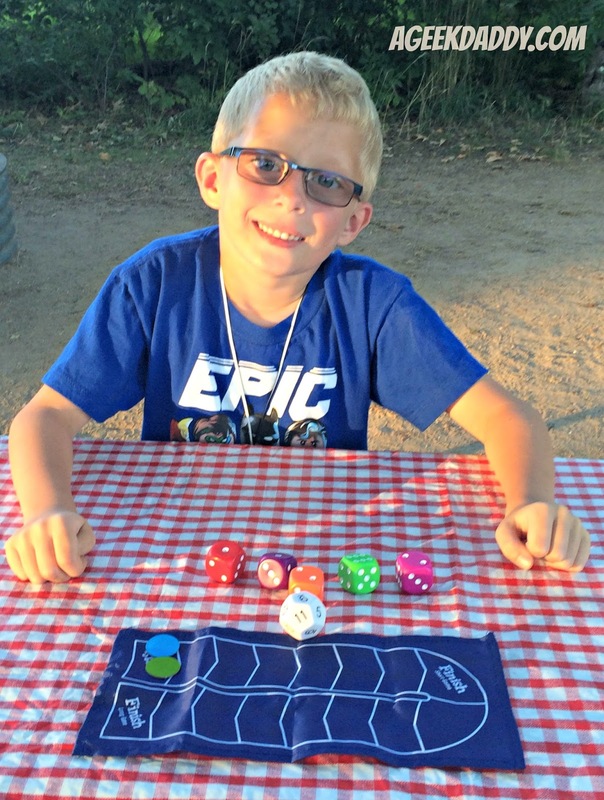 Math Dice Jr. is a dice game meant for children 6 - 8 years old that has players compete to be the first around a game board based upon the luck of their throws combined with applying addition and subtraction skills. 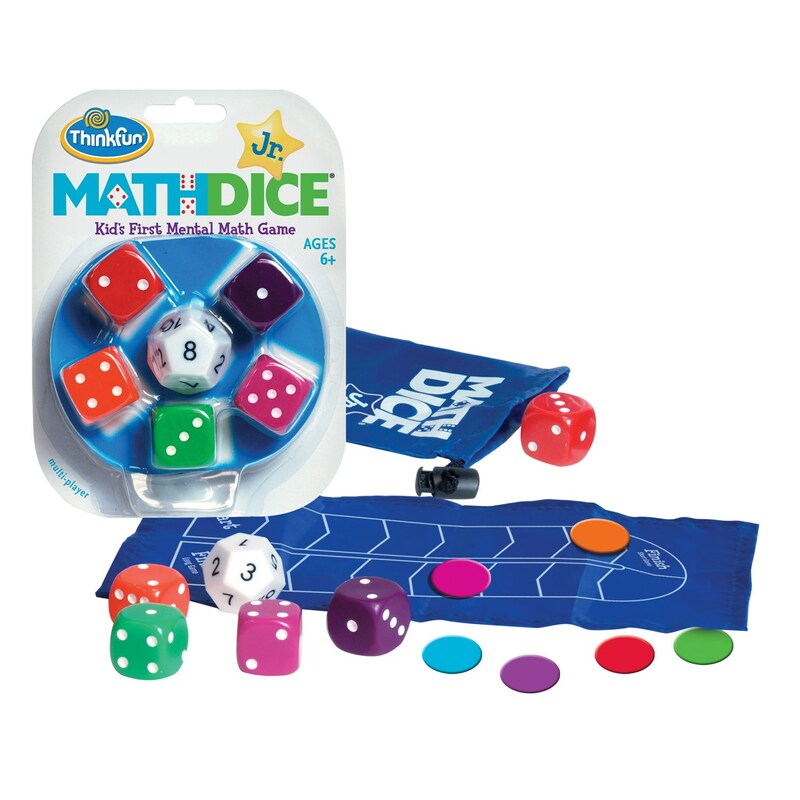 There also is the original Math Dice which is meant for children 8 and up that also incorporates multiplication and division into the game. My 7 year old twins aren't just there yet when it comes to multiplication and division so we stuck with the Junior edition of the game. 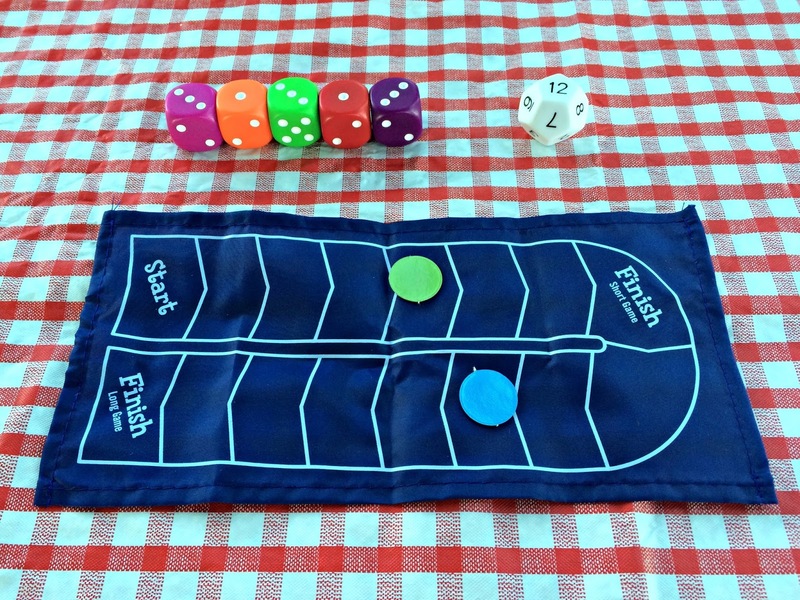 This is a nice game to bring along on a camping outing, road trip or any other variety of family vacation because it is easy to pack consisting of just six dice, a cloth scoring track, five cardboard player tokens, and a convenient plastic carrying bag. We had plenty of room to play it on our campsite picnic table then I just stashed the game away in my backpack when we were done. It let my kids exercise their minds a bit while still having fun competing to see who could be the first to get his or her token to the finish line to win the bragging rights about who is the best at adding and subtracting in their head. Nothing like a bit of sibling rivalry to make a game competitive! 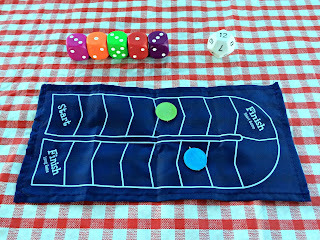 Each player rotates turns rolling the dice. First a 12-sided Target Die is rolled. That number is the target you need to match when you roll your other five 6-sided scoring dice. Add or subtract the numbers showing on your 6-sided scoring dice using whatever equation you need to hit your target number. For every scoring die used in your equation to reach the target number you can move your player token that many spots. First person to go from start to finish wins the game. Here's an example: My son rolls a 6 on the Target Die. He then rolls 1,3.3,5, and 6 with his scoring dice. 3+3 (6) - 5 + 1 (6) + 6 (6) = 6. He was able to move 5 spaces on that roll because of being able to utilize all of the dice in an equation that came out to the target number of 6. Combining a lucky roll with thinking out how to use all his dice gave him a huge lead in that game which he eventually won. In fact my son took a knack for the game and won the most games through our weekend matches crowning him the family champ. There is a short version and long version of the game. We played the longer matches which have you traversing 15 spaces on the scoring track. There is also the short version where a player only has to be the first to cross 7 spaces to win the game. Math Dice Jr. gets A Geek Daddy nod of approval because it makes math fun! 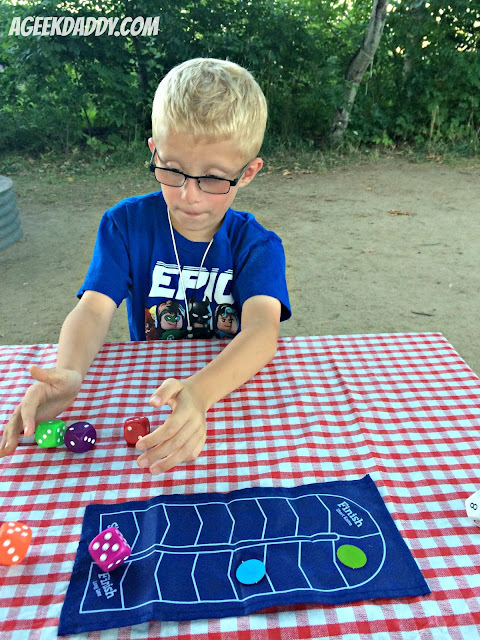 My kids can gripe about doing math homework similar to the equations in Math Dice Jr. yet they were having a blast doing them while playing this game. I also appreciate that it helps calculate equations mentally which can often be a challenge during the early years of school. This really is a nice game to pickup for children between kindergarten and third grade. Anything that has kids equating math with fun is a plus for this dad!